It was a cold night. Really, really cold! Andy’s feet never got warm the entire night despite wearing socks and down booties. Out of desperation in the middle of the night he put a trash compactor bag over the foot of his sleeping bag. This worked in February when he was snow camping but not so well this time around. It hardly warmed his feet while making everything wet. Laurie, who is normally a warm sleeper, was chilly but not cold. Both of our feet were so cold they ached and our hands numb – even with gloves on. 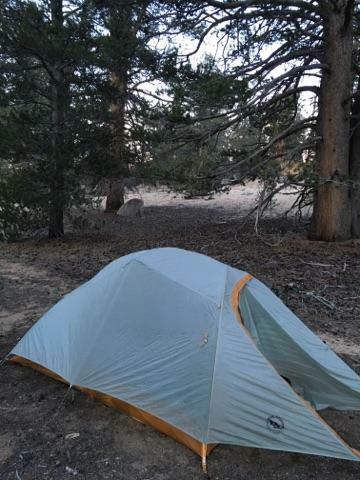 Our tent fly had a layer of ice on it and the poles were frozen. And this was only at 9,000 ft. Knowing that we will be camping higher, and possibly on snow – we decided it would be best to get out of the mountains and get warmer gear. 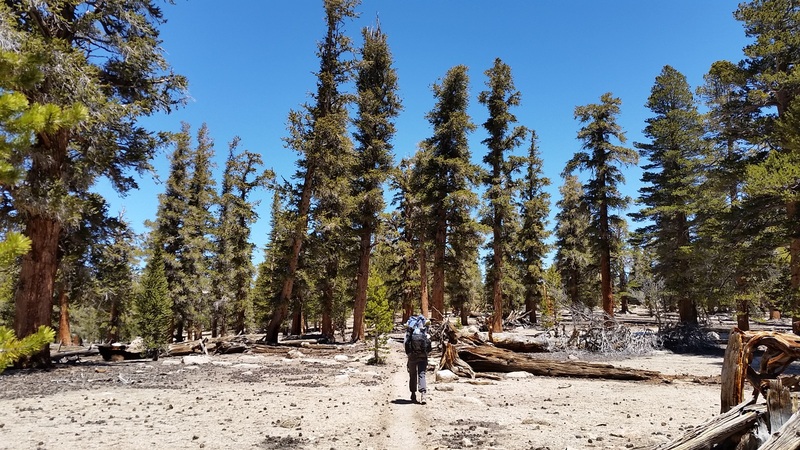 We took the Trail Pass junction to Horseshoe Meadow and out to Lone Pine. It was a hard decision. Leaving the mountains makes Laurie feel like she failed in some way. As if she should have seen this coming and planned better. We talked as we walked uphill into the sunlight, with our toes and fingers gradually thawing out. We are out here to enjoy too, not only to endure. Sure there will be times of discomfort but we want to set ourselves up for success, especially since we are headed deeper into the Sierras. Having wet and cold feet for 1 month on top of not sleeping well felt like a recipe for grumpiness and maybe injuries too. That is not our type of hike. We want to enjoy this adventure. Now warm and with a plan in place we walked up to 10,676 ft. It was nice being back in the mountains. We were surrounded by pine trees, chipmunks running about and grand views. It was familiar and comforting. Just as we had experienced the day before, at 10,000 ft and above there were patches of snow. In the morning the snow was hard and easy to walk across or around. We made lists of what we would buy and Laurie kept scheming of ways to get everything we needed and minimize our time in town. We neared the top of a climb and Laurie, out of curiosity, pulled out her phone. “I have reception…and 4G!” She exclaimed excitingly. “Make sure they aren’t fake bars” replied Andy. Many times we have ‘service’ but can’t call, text or get online. It’s very annoying. Laurie called her mom and it rang instantly. We dropped our packs, found a rock in the sun and went to work. We first called Kathy. She is graciously storing all of our gear and found Laurie’s zero degree sleeping bag and agreed to express ship it to Lone Pine. Warmer sleep for Andy – check. We ordered tall gaiters, waterproof boots and hiking socks too. We hope this combats the days of wet and cold feet due to the inevitable post holing. We hope the gaiters also protect our legs if we posthole near rocks. There is a gear store in Lone Pine where we can get any other miscellaneous warm gear. Feeling good with our purchases we set out again. Laurie was prancing down the trail feeling light and relieved. She likes having plans to combat the unknowns. Needless to say, this trail and its constant changes are hard for her at times. Our orders and sleeping bag will arrive Tuesday afternoon. So we will probably be in Lone Pine until Wednesday morning. We can utilize the time to rest our achy feet, stretch our tight muscles, do laundry, catch up on our blog and Instagram, and check in with family and friends. 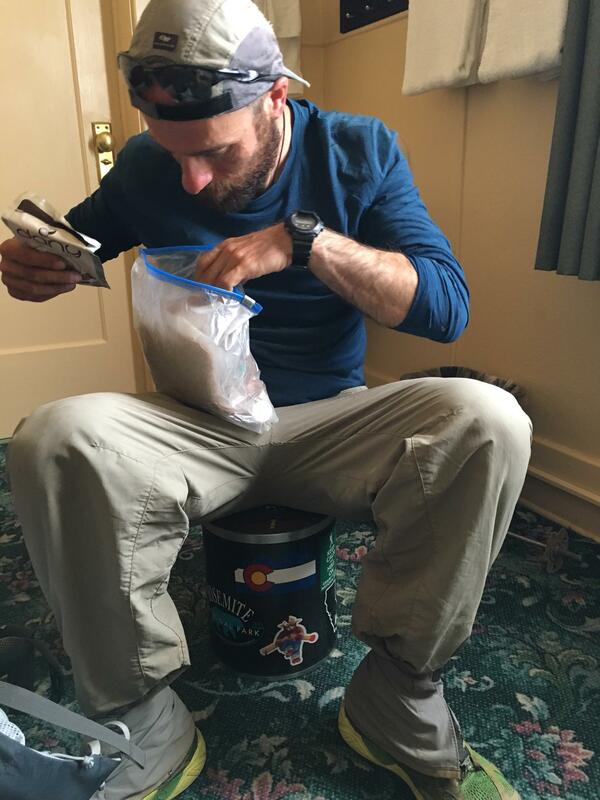 We didn’t mention eating above because on the trail we have started to get hungrier and are eating more, but in town we still don’t find ourselves wanting to eat, eat, eat. This is probably due to how well we eat on trail. The forest was beautiful. Occasionally we would get views of yellow and green meadows or snow capped mountains. The air was warm with a bone chilling wind. Our warm gloves were on and off all day. We stopped at Diaz Creek junction to get water around noon. It was a .2 mile walk off trail where we ran into 2 hikers (Google and Surplus) eating lunch. We chatted a bit and they mentioned that they heard we were in a cold spell and that’s why it’s been so cold at night. We don’t know for sure if this is the case and like our plan to continue with warmer gear – even if the weather warms up a bit. Andy walked down a steep embankment to get water. He got 1.5 liters of water (nice change from the 6-7 liters in the desert) to fill up our Platypus bladders. As we were transferring water into Andy’s bladder Laurie noticed a small tadpole swimming in the bottle. Oops! We dumped out the remaining water hoping our filters would catch whatever else was living in the stream. We walked another 3.6 miles to our trail junction with the trail gradually climbing. The air was still cool but we were feeling sluggish. 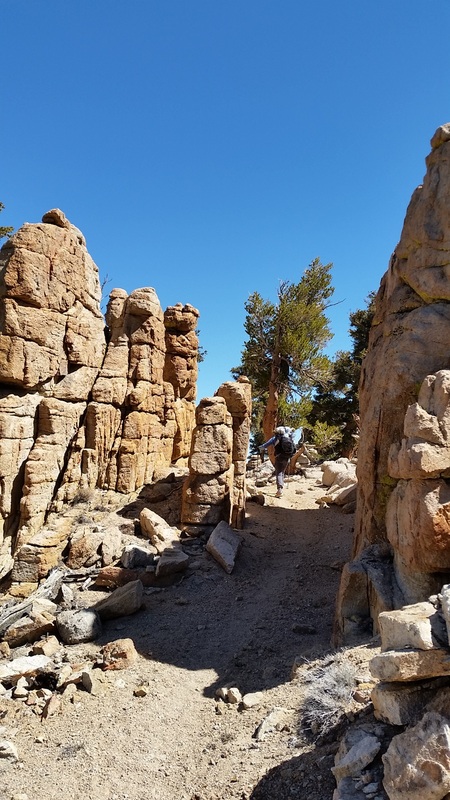 We ate only bars – partially out of ease because they were accessible, and partially to save trail food for when we return to the mountains in 3 days time. We also didn’t want to stop for a proper lunch to save time. We feared that if we got to Horseshoe Meadows too late we’d miss the day hikers and potential rides down to Lone Pine. And we really didn’t want to spend another cold night at 10,000 ft or worse, have to road walk down 23 miles and 6,000+ ft to Lone Pine. We got to the Trail Pass junction around 2:20pm. One of our calls earlier today was to the Dow Villa Hotel, where the woman who answered offered to come get us at 3pm when she got off work. We declined her offer not knowing how long it would take us to get to Horeshoe Meadows. Now at 2:20pm we tried to call but had no reception – oh well. We descended down the trail, losing and finding it numerous times in the snow. 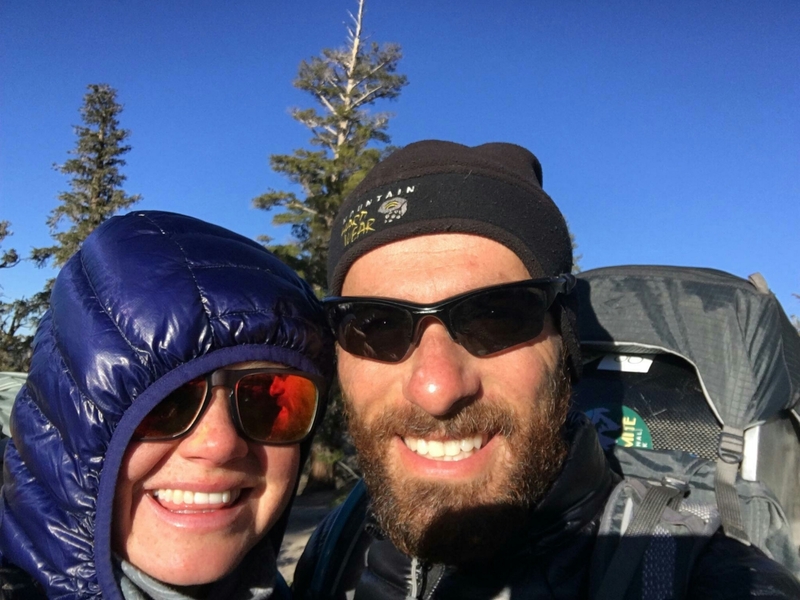 We referred to the Guthook’s PCT app (uses gps) many times to confirm we were on track and continued down on snow, on dirt and at times downed tree logs. Finally we intersected Horseshoe Meadow trail and found the trail easily from there on out. We could see the sandy meadow through the trees. As we neared, the beauty of our surroundings struck us both. 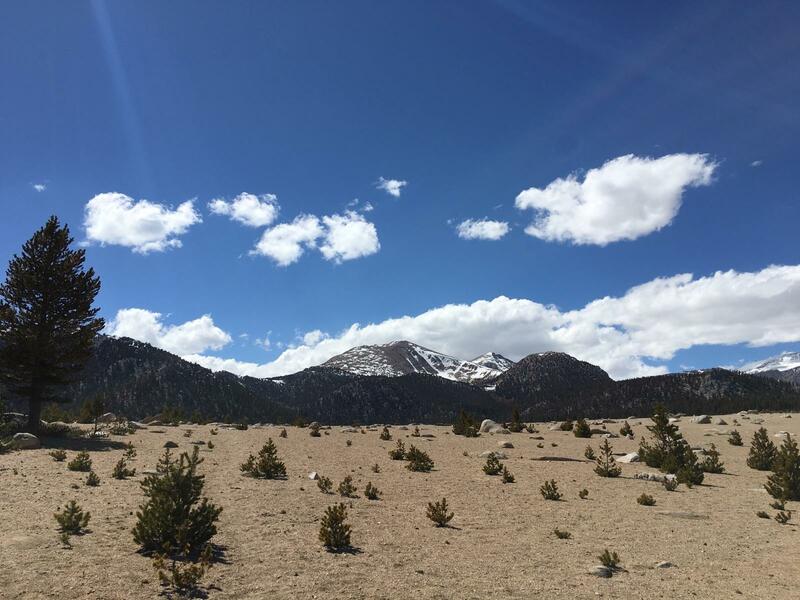 Small pine trees stuck out of the sandy meadow with snow capped peaks in the background. Wow! We stopped in awe, took a few photos and continued on, commenting on the beauty of this place. Andy has been to Lone Pine many times but asked himself why he’s never ventured here. His thoughts were put on hold when Laurie spotted a day hiker in the distance. “Run” she exclaimed while pointing. “I’ll go catch her” replied Andy as he took off. It was hard walking on the sandy trail. Both of our heart rates went higher than they had all trip! Andy caught up with Moonburned about 0.3 of a mile from the parking lot. 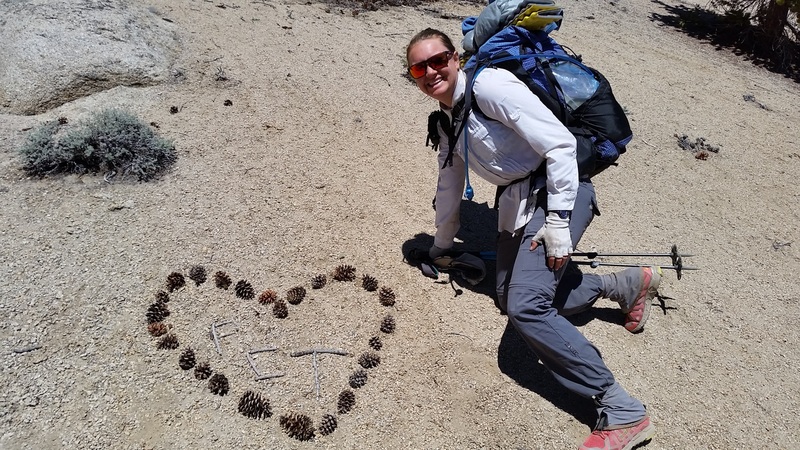 She hiked 750 miles of the PCT last year and had to get off due to an injury. She hopes to do it again next year and was delighted to give us a ride. We twisted our way down Horseshoe Meadow Road. It is a beautiful road blasted through the mountain side. Andy had mentioned to Laurie about biking up this road and now we realize why it is considered one of the most challenging rides in the US. The road is continuously uphill for 19 miles! 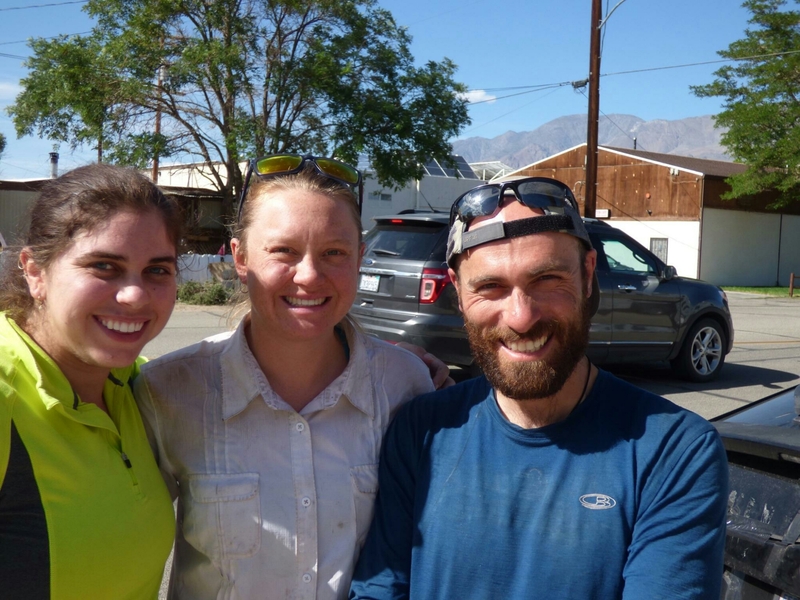 Once in Lone Pine we checked into the hotel, chatted with familiar hikers and ones we haven’t seen before in the lobby and took showers (Andy’s first in 200 miles!). 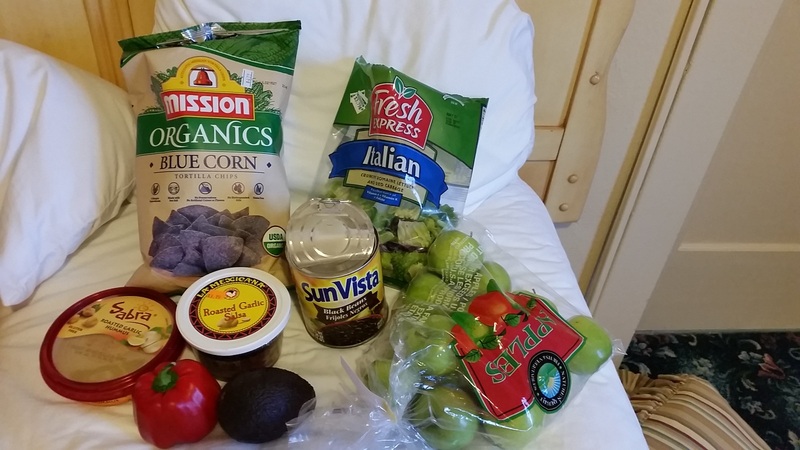 We went to the gear store, then grocery store and ate dinner in bed. Laurie was craving black beans so we got a large can with a pop top and she ate lettuce and beans out of the can – classy! We complimented that with hummus, blue corn chips and salsa. We chatted with family and ordered more items for later on down the trail. We are happy with our plan and feel more prepared to go deeper into the Sierras. Predictably we are going to bed later than we wanted, but hey it’s 10:30pm, which is better than we did in Mojave. Tonight we are grateful for our town fund contributors and warm showers. Thanks for the lift Moonburned! Hi Andy and Laurie – martyn here from the uk. I’m planning to do the pct in 2017 and am finding your blog really helpful and inspirational. Would welcome any tips on gear especially water filtration that you’d like to share. Hey Martyn, thanks for your comment. When we finish our hike we’ll do a write up of what worked for us and what we changed. For now though, check out our gear list tab. Most of our gear is the same, including water filtration. You absolutely made the right choice, going to town to gear up and rest. The risk of death by hypothermia isn’t worth it. The longer you wait, the more the snow melts and the more pleasurable your trip through the Sierra will be. Love following your journey, thanks for sharing! Thanks for your support Diane! Hello Andy & Laurie. I have a brother hiking the PCT this season, but he’s a month behind you guys. I enjoy reading other bloggers on the days I am waiting for him to upload. I really appreciated the line: “We are out here to enjoy too, not only to endure.” That is soooo key. That is the right mentality. Thanks for reminding us readers of that. Cheers! Thanks for your support Sarah! We hope your brother is enjoying his hike.